In his first book, It's Not Just Who You Know (which rose to #2 on the New York Times bestseller list), world renowned leadership speaker and former CEO of Up with People Tommy Spaulding talked about the power of building genuine and lasting relationships both personally and professionally. 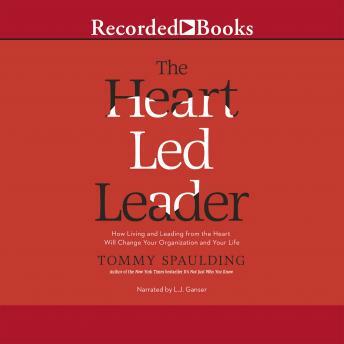 In his new book, The Heart-Led Leader, Spaulding turns his focus to ourselves - to who we are. Authentic leaders, Spaulding says, live and lead from the heart. The values and principles that guide our lives and shape our ability to lead others is far more important than our title, or our ability to crunch numbers, or the impressive degrees we display on our walls. To effect true transformational change, heart-led leaders draw on the qualities of humility, vulnerability, transparency, empathy and love. Illustrated with stories from his own life, and from some of the exceptional leaders he has met and worked with over the years, Spaulding unpacks what those qualities mean, talks about the 18-inch journey from the head to the heart - from our intellect to our emotions - and shows us how to incorporate them into our careers, into how we manage and lead others, and into how we live our lives. It is a vision of leadership that has the power to transform everything we do, and the lives of everyone we touch.